Honey can serve as an excellent sweetener for baked goods. In addition to sweetness and extra flavor, it has great moisture retention and lends a lovely color to breads and cakes. Honey is derived from the nectar of plants gathered, modified, stored, and concentrated by the honeybee. It is made up of levulose (fructose) and dextrose (glucose). Honey has innumerable sources, such as borage, buckwheat, avocado, lavender, thyme, tupelo, and clover, and its flavor varies accordingly from mild and floral to intense and leathery. Honey has been used as a highly effective natural antibacterial and preservative through the ages, as far back as ancient Egypt. Honey is antiseptic, antibiotic, antifungal, and antibacterial and it never spoils. For this very reason, most natural honeys should not be used in bread baking as they will kill the yeast necessary to raise the bread! Pasteurized honey, however, such as those found in supermarkets works perfectly. 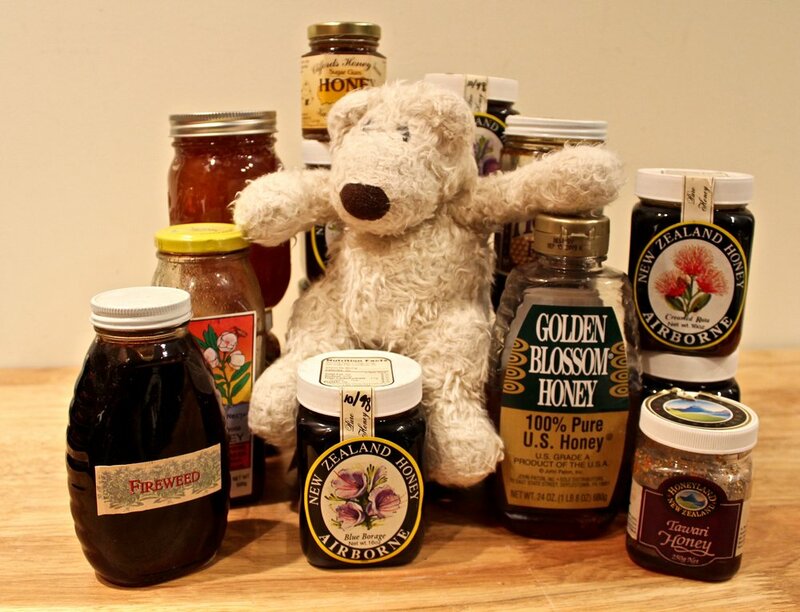 As it doesn’t state on the label whether the honey has been pasteurized or not, if you want to experiment with the flavors of other honeys (I love blue borage from New Zealand, and lavender from Provence, for example), try proofing the yeast first by adding a little honey instead of the usual sugar. If there is no bubbling activity use the honey in cake or tea instead. One cup of honey weighs 336 grams, of which 17.2% (57.8 grams) is residual water. So 3/4 cup of honey minus the residual water is 208 grams, which is almost the same weight as the 1 cup of sugar, which contains only 1 gram of residual water. Because honey browns at a lower temperature than sugar, it is also recommended to lower the baking temperature by 25˚F/14˚C. Cakes made with honey instead of sugar will retain their moisture longer, as honey is highly hygroscopic, but they also will be denser because sugar crystals capture air during the beating process and result in an airier crumb. Honey cakes are traditional around this time of year for the celebration of the Jewish New Year on September 14. This Weekly Baking Tip is a reposting from 9/9/14 in the Tips & Techniques category on Our Blog page for Food Arts Magazine's Sept. 2014 edition. Click here to see the posting. We have 16 other Tips & Techniques postings for you to explore.